Got Your Car Damaged in a Collision? Bring your car to us to get it back up and running. Collision Repairs Guaranteed for As Long As You Own Your Car! Has your car met with an accident? Don’t panic! Stop by Wilson Collision & Alignment Center. Call us to learn more about our auto repair services and schedule an appointment. You can also directly visit our auto body shop for your vehicle repair needs. As Glace Bay’s largest professional auto body repair shop, we offer services such as major collision repairs, minor dents and scratch repairs, rust repairs, paint repairs, frame repairs and wheel alignment service. We also offer U-Haul rental service. Wilson Collision & Alignment Center is a family-owned auto center owned by Gary and Frances Wilson. Gary is a 3rd generation auto repair technician who follows his father's and grandfather's footsteps and provides clients with prompt and professional service. You’ll be glad to know that since 1980, we’ve been serving the auto repair needs of people in Industrial Cape Breton and surrounding areas. We have over 35 years of experience in handling all types of insurance related auto collision repair work. You can confidently depend on us to get your damaged vehicle back on the road quickly. At Wilson Collision & Alignment Center, complete customer satisfaction is our topmost priority. Not only do we use the most advanced techniques for repairing your vehicle but we also ensure to provide fast turnaround time. When any vehicle is brought to us, we examine it thoroughly and explain the entire repair process to the client. Whether it’s a small or big repair job, our team of auto technicians are committed to providing exceptional service. It’s the result of our high-quality workmanship and promptness that we maintain an excellent reputation in Glace Bay, New Waterford, Donkin, Sydney and surrounding areas. Our 5-star rating on Google substantiates the trust that clients have with us. We have the experience to fix any bumper issue. Let us increase the life of your auto tires. Rely on us for safe and efficient long- and short-distance hauling services. Check out the reviews from our valued customers! "Wilson Collision & Alignment Center has been a trusted choice for auto body repairs in the Industrial Cape Breton area. Browse through some of the testimonials from our satisfied customers." "I recently had the misfortune of being struck by another vehicle. I took my car to Wilson Collision & Alignment Center. The staff was very friendly and professional. They picked my car up and returned it when the work was done. My car is older and you can’t tell the difference between the old and the new. I’d highly recommend them. Extremely pleased!" "I took my 1997 Honda Del Sol to Wilson Collision & Alignment Center to see if they would paint it. The car was in good condition for the year, but was badly faded "red". When I got it back, I could not believe the professional job they did. I get so many compliments and it's all due to their work and dedication to satisfy their customer. The management and staff are friendly and professional. It was a pleasure doing business with them." "My family has been doing business with Wilson Collision & Alignment Center for many years. Whenever there has been a collision problem with our car, Gary and his staff have always been there to take care of us. They pride themselves on quality work and we have certainly come to depend on their honesty, integrity and service that go well beyond our expectations every time." "The management and staff at Wilson Collision & Alignment Center are fantastic. The paintwork on my F-250 truck topper is a perfect match and looks great. Great job, Wilson Collision & Alignment Center!" "I have dealt with Wilson Collision & Alignment Center many times over the years, on both small and large projects. I’m very impressed with the promptness, professionalism and courtesy of the entire staff. I’d highly recommend them." - John Peach, President, Peach Masonry Ltd.
“Wilson Collision & Alignment Center has a large, modern facility with the best of equipment and is a long serving business with excellent reputation for quality workmanship. It repairs small or large dents to complete overalls, and supports community groups and events. I’d highly recommend this business. Very satisfied!" "The customer service and the work I got done to my car were exceptional. I’d highly recommend Gary Wilson and his staff for any auto body repairs. These guys really take "pride" in their work." 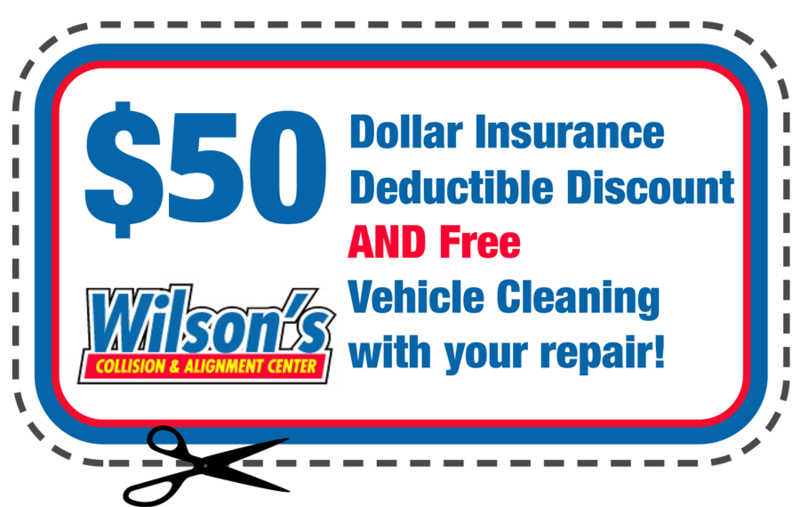 Wilson Collision & Alignment Center offers senior citizen discounts and lifetime collision guarantee. Contact us for more details.